Burnley FC Ladies boosted their North West Womens Regional League Premier Division title hopes with two big wins over the week. First up, they produced what manager Matt Bee described as “a big performance” to beat leaders Tranmere Rovers Ladies at Prairie Sports Village. And on Sunday, they hit Sir Tom Finney LFC for five at UCLAN Sports Arena Preston. The Lady Clarets now sit four points off top spot with five games in hand. Against Tranmere, both sides quickly tested the defensive abilities of the other. Justine Wallace struck a free kick over, and Tranmere broke away at speed to be intercepted by Clarets player of the match Vikki Eastwood. The deadlock was broken when Georgia Payton passed across to Leah Embley, positioned centrally in the box, and she finished well. A Tranmere break towards goal could have levelled the score, but it was thwarted by Clarets stopper Taylor Gregson, who burst out and intercepted on the edge of her area. In the second half, Embley put the contest out of reach of Tranmere with a further three goals in a commanding display, and Payton put the icing on the cake with a fifth goal to seal a deserved victory. Then on Sunday, goals from Wallace, Chloe Fell, Payton, Lynette Craig and Rebecca Hayton made up the Clarets’ five-goal tally, before a well-deserved consolation goal late in the game for the home side. At the outset, the Clarets were subjected to some considerable pressure as the home side neatly passed the ball around. Payton was set free on a couple of counter attacks for the Clarets, but met a determined goalkeeper, who forced her attempts wide. Wallace opened the scoring on 28 minutes when she received a corner at the near post and neatly turned and shot home. Fell struck her first goal for the Clarets when the received a partial clearance from another corner and was on hand to collect and shoot through the crowded box. 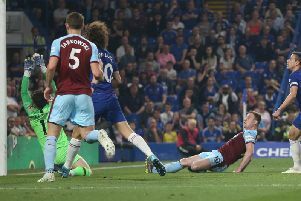 The Clarets started the second period with a two-goal lead and they added to their lead when Payton evaded the off-side trap to slot past the keeper. Craig then shrugged off a defender and beat the keeper at the second attempt. Soon after Hayton concluded the Clarets’ scoring when Payton passed across goal for her to slot home. The home side recovered a deserved goal late on. The Lady Clarets play a cup semi-final on Sunday against Stockport County Ladies at Barden Athletics Ground, kick-off at 2 p.m.